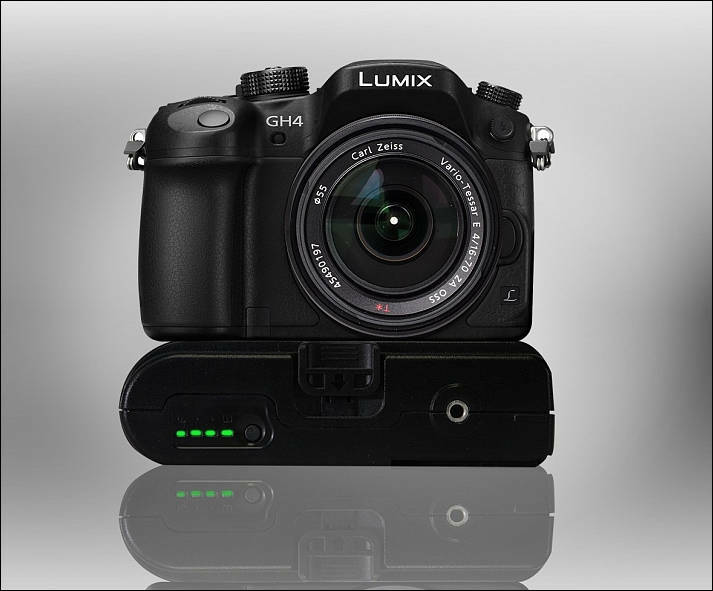 Anyone successfully using external batteries with the GH4? I am using the ones I had with the GH2 which was a 9V/12V Li-ion external battery which was purchased from eBay (basically one of these: http://www.ebay.com/itm/DC-12V-6500MA-9V-8500MA-5V-15000MA-Rechargeable-Li-ion-Battery-Pack-for-CCTV-Cam-/370960595674?pt=US_Rechargeable_Batteries&hash=item565ef97ada). What I am noticing is that when I turn on the GH4, I see the battery indicator on the GH4 show full battery status but flickering like mad. If the LCD is on, the display flickers too. The flickering battery indicator actually is an issue because the moment you try to access the menu system, you get kicked out immediately. Although it seems that I can still record despite the flicker. If you are using an external battery solution successfully, what do you have? Which one do you use mrbill? Naztech look interesting. Ditto on the http://www.ebay.com/itm/External-Rechargeable-Battery-for-Panasonic-GH3-GH4-Video-8500mAh-DMW-DCC12-/181134841252 These don't work and the seller doesn't reply when contacted. So Mrbill, Just to confirm, do you use one of the attachments that come with the Naztech PB15000 Universal Power Bank (see pic) to plug into the dummy battery like this one- http://www.ebay.com.au/itm/like/181469766404?limghlpsr=true&hlpv=2&ops=true&viphx=1&hlpht=true&lpid=107 And set the Naztech to 9v? I have my voltage selector set to 12v on my Naztechs. I come out of the Naztech into my voltage regulator, which steps the voltage down to 8.8v (I bought the cables to do this from an electrical store in the UK called Maplins). I come out of the voltage regulator and plug into the dummy battery of the ac unit (like the one you link to), and then into the GH4. I can't see why it shouldn't work bypassing the voltage regulator and just setting the Naztech to a 9v output, but please be aware you do this at your own risk. 8.8v I know is working..
Just some information. I actually use voltage regulator to drop 12V down to 10.5V. At this level, the GH4 thinks the AC adapter is connected. If I go to 9V or less, the battery indicator shows up and the camera will do checks to verify the battery (which then fails and then turns off the camera). Around 9.7-10V, the camera constantly switches between battery and no-battery mode - this shows up as a flickering battery indicator. When this happens, you will have issues accessing the menu system because it will keep closing on you, however, record does work.